Frome Town Council keeps a rolling series of displays on this board relating to community, organisational and commercial topics in Frome. 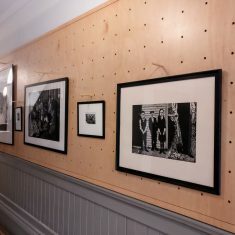 Anyone can come in and view the exhibition. If you would like to use this space, either as a community group, a local organisation or a community artist, contact us by email. The board space is 1.5m width by 5.8m in length. The Late Bloomers display is the work of three friends who live in Frome and met in an Cert Class. 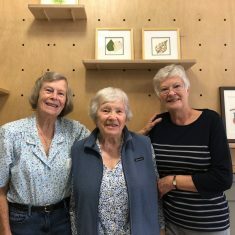 Hazel, Margaret and Shirley have a real passion for watercolour painting and decided to band to together to become the ‘Late Bloomers’. They have created a series of paintings, primarily with a focus on flowers which they hope will be enjoyed by others. A series of collages by Vanessa Taylor. These are made up of plastic objects found at Freshwater West Beach, South Pembrokeshire. 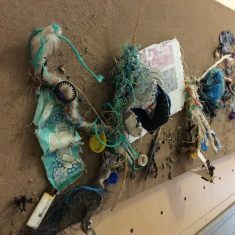 This exhibition draws attention to the issue of plastic pollution, especially in our oceans. Frome Town Council is committed to being single use plastic free by the 1st April 2018. Here you’ll find some alternatives to plastic bottles and straws, encouraging everyone to take positive steps towards moving away from single use plastic. 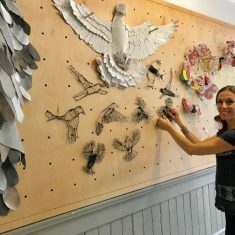 Frome’s new plaque trail is featured. This walk will take you to explore the rich heritage of Frome through its buildings and the interesting people who occupied them, including figures like poet Christina Rossetti and the Duke of Monmouth, who attempted to overthrow King James II. The trail follows the plaques established by the Frome Society for Local Study. 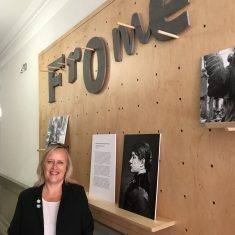 The exhibition was part of Frome’s effort to gain Walkers are Welcome accreditation, which would mean that Frome’s public footpaths are maintained and promote footpaths and walking groups in town. 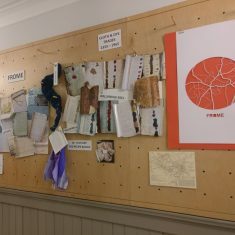 An exhibition on Frome’s cloth and dye trades (1333-1965), illustrating the market town’s 600 year heritage of woven cloth and indigo dye extracted from the woad plant. This exhibition is based around “Woad To This & The Cloth Trade of Frome” by Caroline Griffiths, an illustrated book available from the FSLS. 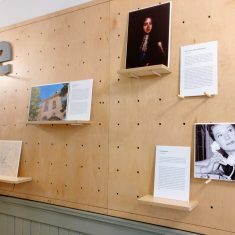 This exhibition was intended as a taster to let people know a little about the incredible Singer family- of J.W.Singer & Sons, the Frome foundry and Art Metal Works – and their links to artists in Europe through Camille Claudel, French sculptor. Read more about the exhibition here, or learn more about Camille Claudel here. A holocaust memorial piece by Critchill art students from years 10,11, 12 & 13. Their project reflected on a story about a little girl called Hana Brady, who sadly ended her life in the concentration camps of Nazi Germany. Her story is told in the book ‘Hana’s Suitcase’ by Karen Levine. They used various materials and explored the Japanese art of Origami to create an act of remembrance through art.